Huawei, the Chinese smartphone maker, said the company will look at building its own OS as a plan B if a ban is extended to US-based Google and Microsoft. A green day for the major Asian stock markets: Hang Seng increased 396.75 points (1.37%) to 29,409.01; Shanghai increased 74.67 points (2.47%) to 3,096.42; NIKKEI 225 increased 133.65 points (0.62%) to 21,584.50; KOSPI increased 3.38 points (0.16%) to 2,179.49；SENSEX and ASX 200 increased 70.75 points (0.19%) to 38,095.07 and 15.30 points (0.25%) to 6,190.50 respectfully. The Asian currency markets also had a green day today: The AUDUSD increased 0.0005 or 0.07% to 0.7092; the NZDUSD increased 0.0014 or 0.20% to 0.6857; the USDJPY and the USDCNY increased 0.0770 or 0.07% to 111.5270 and 0.0086 or 0.13% to 6.7203 respectfully. Both gold and silver had a green day today: gold increased 3.13 USD/t oz. or 0.24% to 1,304.63 and silver increased 0.06 USD/t. oz or 0.41% to 15.32. Commons Speaker John Bercow dismissed another vote on previously rejected Brexit agreement if the motion remains “substantially the same.” The GBP took a tumble falling 0.6% to 1.3210 against the dollar. Elsewhere, the USDCHF decreased 0.0013 or 0.13% to 1.0004. The EURUSD took the opposite route, increasing 0.0012 or 0.10% to 1.1337. A mixed day for the major European stock markets: CAC 40 increased 7.51 points or 0.14% to 5412.83 and the FTSE 100 increased 70.91 points, or 0.98% to 7,299.19. However, DAX took the opposite route, decreasing 28.63 points or 0.25% to 11657.06. U.S. stocks maintained their upward momentum this Monday. The Dow advanced over 65 points (+0.25%, 25914.10 close), marking the fourth consecutive day of growth for the index. 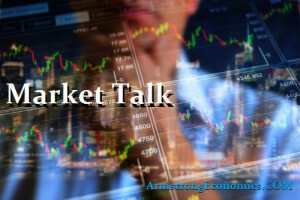 The Nasdaq and S&P 500 both posted their best numbers of 2019 after closing at 7714.48 (+0.34%) and 2832.94 (+0.37%). The Russell 2000 advanced +0.67%, finishing the day at 1563.93. The global marketplace eagerly awaits the Federal Reserve’s plan this week to share their “dot plot” strategy and economic projections for the year. In January, Federal Reserve Chairman Jerome Powell stated that the Fed would maintain a “patient” approach to raising interest rates due to geopolitical uncertainties and a reduction in consumer activity during Q4. He also noted that the Reserve plans to actively work toward reducing the current balance sheet. Although it is largely expected that rates will remain the same (currently standing between 2.25% and 2.5%), investors will be looking for clues as to when the next inevitable hike will occur. Large corporates were a mixed bag today: Boeing (-1.51%) and Disney (-1.61%) limited the Dow today, while Microsoft (+1.43%) and Apple (1.02%) helped drive it into positive territory. Facebook (-3.32%) was one of the anchors on an otherwise positive day for the larger S&P 500. The USD Index slightly dropped by -0.09% (last reading 96.51). The USD/CAD remained nearly stagnant (-0.01%, last reading 1.3332). Canadian markets experienced a bullish start to the week as well. The TSX Composite gained +0.69% (16251.37 close), while the TSX 60 rose +0.72% (970.27 close). Brazil’s Bovespa continued to soar to new highs this Monday (a resurgence of Emerging Markets), posting a +0.86% gain (99993.92 close). Cuba is the latest country to feel the pressure of the Venezuelan sanctions from the US. Opposition leaders called for a complete stop to the deal, which allowed crude for highly skilled labor in the fields of medicine and other professions. The most of the oil market had a green day today: Crude Oil increased 0.46 USD/BBL or 0.79% to 58.94; Brent increased 0.23 USD/BBL or 0.34% to 67.26; Natural gas and Gasoline increased 0.05 USD/MMBtu or 1.65% to 2.84 and 0.02 USD/GAL or 1.15% to 1.88 respectfully. However, heating oil took the opposite route and decreased 0.0021 USD/GAL or 0.11% to 1.97. Top commodity gainers are Palm Oil (3.85%), Ethanol (2.82%), and Sugar (2.40%). The biggest losers are Coffee (-2.06%), Lumber (-1.27%) and Wheat (-1.14%). Japan -0.04%(+0bp), US 2’s 2.45% (+1bps), US 10’s 2.60%(+1bps), US 30’s 3.01%(-1bps), Bunds 0.08% (-1bp), France 0.46% (-1bp), Italy 2.45% (-5bp), Turkey 15.55% (-7bp), Greece 3.74% (-6bp), Portugal 1.27% (-4bp), Spain 1.17% (-3bp) and UK Gilts 1.19% (-2bp).